Would you like to have an enjoyable kitchen remodel experience? Successful kitchen remodeling projects do not happen by chance, they are carefully planned and orchestrated by experienced kitchen remodel contractors. When is a good time to remodel your kitchen? 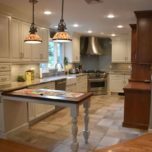 Embarking on a large home remodeling project like a kitchen remodel requires detailed planning not only for the remodeled space but how the family will function during the renovation. As such, many families choose to renovate during the warmer months so they can prepare meals outdoors for their family. 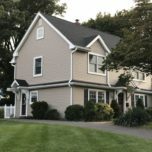 That places a higher demand on the spring and summer months leaving the fall and winter a little sparse for home remodeling contractors, which is why most kitchen remodeling companies offer reduced prices during those months. Kitchen remodeling contractors often set up temporary kitchens in an adjacent room using your existing appliances and cabinetry. This allows you to take full advantage of of the off season pricing while still being able to take care of your family. Who will help with the selections? 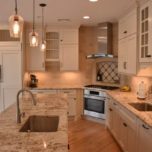 At first glance it seems that there are not too many selections in a kitchen remodel, but the truth is, there are dozens of selections that need to be made. Everything from cabinets to countertops, tile, plumbing, electrical, etc. 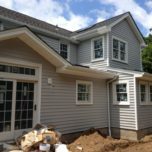 working with a home remodeling contractor that will guide you through these selections will not only move the project along more swiftly, it will give you peace of mind knowing what you are selecting is correct for your projects requirements and aesthetic. It’s an added bonus to have an objective opinion to help you navigate the myriad of choices out there. Some Design Build firms even accompany you the the various vendors at no additional cost! Just about all kitchen and bath cabinetry looks the same, that is until you look at the details. Builder grade cabinets will have doors and drawers that are not as wide as the face frame of the cabinet, this is known as a semi overlay cabinet and will be the least expensive option. Semi custom cabinetry will have doors and drawers that are just as wide as the face frame of the cabinet and come in a wide variety of styles, finishes and options. Semi custom cabinetry will be in the mid range for costs. Custom cabinetry can be overly doors and drawers or inset doors and drawers and come in the widest variety of options, styles and colors. Custom cabinetry will be the most expensive and also have the longest lead times. Look for cabinetry that is made with American plywood, solid wood face frames, solid wood doors and a lifetime manufacturer guarantee. 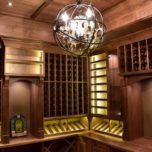 Pay close attention to how the components and parts of the cabinetry are joined together, do they look like they were put together with care? How does the finish feel, is it smooth or rough? Do the doors and drawers line up nicely? Is the finish consistently applied? 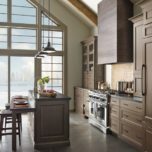 Look for a lifetime manufacturer warranty on the cabinetry as well as the cabinet hardware. Taking the time on the front end to plan out the project may seem like a waste of time, but I can tell you that is not the case. 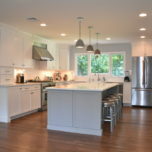 Skillfully drafted plans and a proposal with detailed line item descriptions and costs for your kitchen remodel create a very transparent process that is easy to understand. Changes in plans are unavoidable for many reasons, the most common we see are customer driven (might as well while you’re here requests) and concealed damage/unexpected conditions. 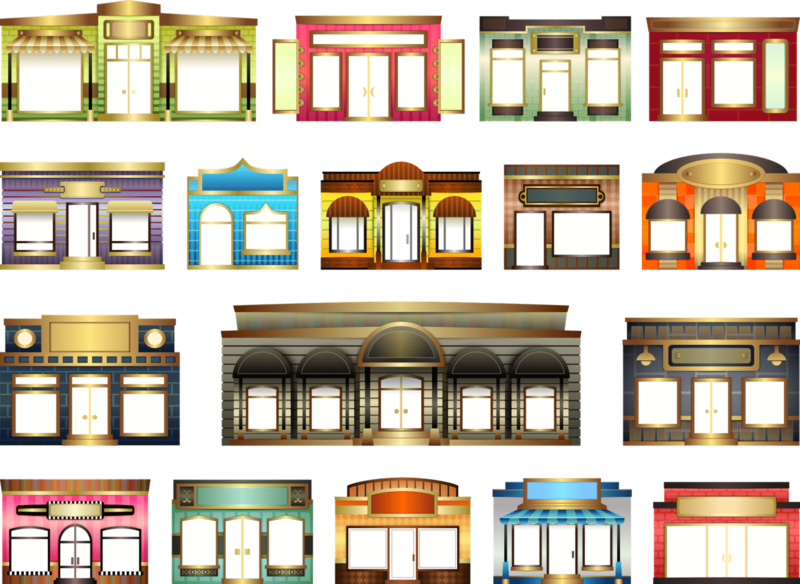 The cost can go up or down depending on the situation, having a line by line quote allows you to see exactly what was figured for so you don’t have to worry about being taken advantage of. See example proposal/estimate below. 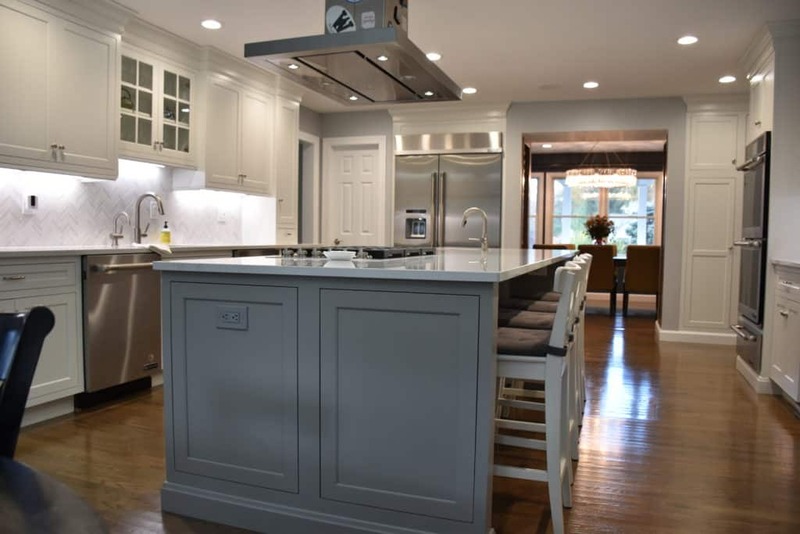 A kitchen remodeling project cannot be successful without project management and it cannot be overstated as to how important it is not only to drive the process but to produce a high quality end product that you will enjoy for many years to come. Building permits can certainly be a hassle if you are not familiar with the process. 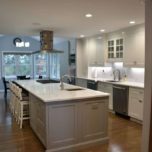 Many kitchen remodeling companies handle the initial application for permits but all to often, that’s where it ends as well. Be sure to ask if the contractor includes sitting for all the required building inspections up to and including final inspections. New Jersey State Law, N.J.A.C. 13 :45A -16.2, requires that final inspections be made before final payment is made to the contractor. Without final inspections you will not receive the necessary Certificate of Occupancy/Approval. 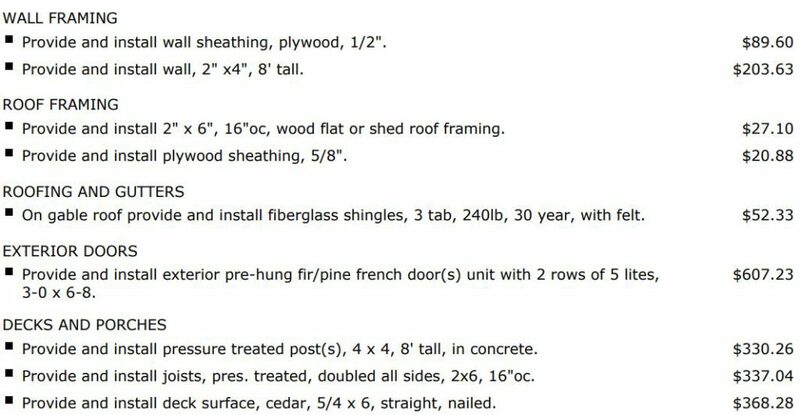 This information is also contained on the back of the yellow permit card that goes in your front window when you start your kitchen remodeling project. 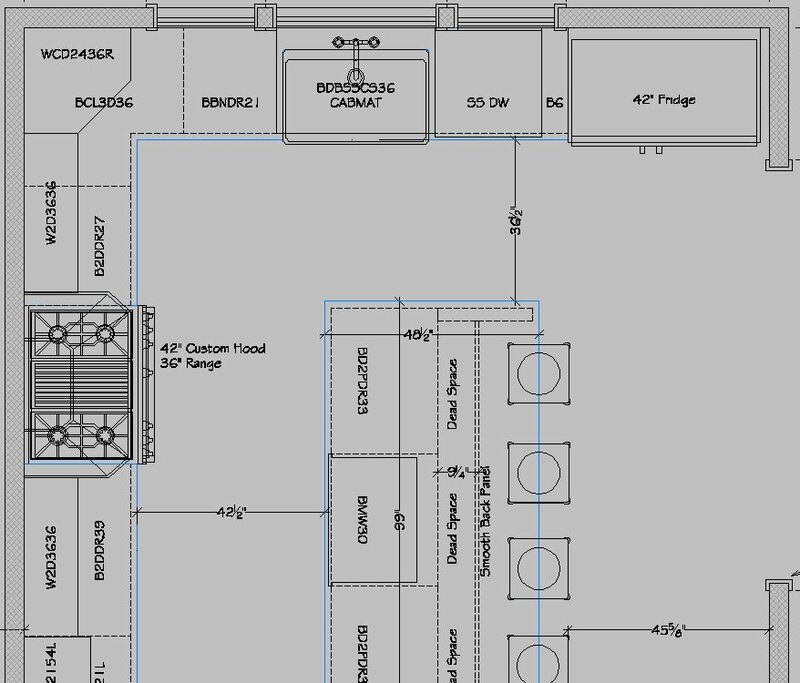 Kitchen design plans are more than just a cabinet layout – a detailed set of drawings spell out the nuances including; tile plans, electrical plans, plumbing and appliance layouts and much more. Another way to think about it is to compare it to preparing a thanksgiving day meal, someone has to be in charge of what’s on the menu, when to put the turkey in the oven and when to serve dessert. If no one is in charge of those items you can rest assured that the meal will turn out poorly and the same can be said for your kitchen remodel. There is no nice way to put it, what’s about to happen in your home is going to be loud, intrusive, messy and as you’ve probably heard, dusty! As part of a high quality job, one would expect that the kitchen remodeling contractor would prepare the space to be remodeled by applying paper to hardwood floors and adding a layer of Masonite for floor protection, self adhesive carpet plastic as runners thru carpeted areas, plastic walls with zippered access to control dust and to provide some privacy, exhaust fans for negative air pressure which also helps to lower the amount of dust. Access into your home should be controlled by keeping key in a lock box or by providing a temp code to a garage door. Would you like help planning your kitchen remodeling project? Call us at 973-636-0100. Create a beautiful corner stove kitchen design layout for your next kitchen remodeling project! Find out the math behind it and which appliances work best for your corner stove kitchen project. Is a corner stove right for your kitchen cabinet layout? Do we need a focal point in a given corner? Can we improve the layout overall by placing the stove on a corner? Does the ventilation preference allow for a corner stove? Do we need extra countertop space? Generally speaking almost any stove, cooktop or range top will work in the corner stove kitchen design with some exceptions. 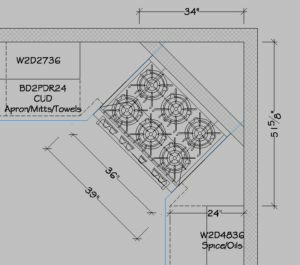 The tricky part comes in with the addition of the ventilation preferences, this is because the adjacent upper cabinetry sits on the 90 degree axis and the corner stove sits on a 45 degree axis (see sample plan below). This means we have to pay particular attention to the wall located behind the stove/ventilation unit and the depth of the appliances, these all need to be in sync for proper configuration. For this application it is best to use a stove without a back which is know as a slide in stove or model with an island trim which is a low profile back. To figure out the placement of the adjacent cabinets you will need to know the width of the appliances and the depth of both the lower and upper cabinetry. We will also need to account for the desired counter top overhangs and fillers on the base cabinets. 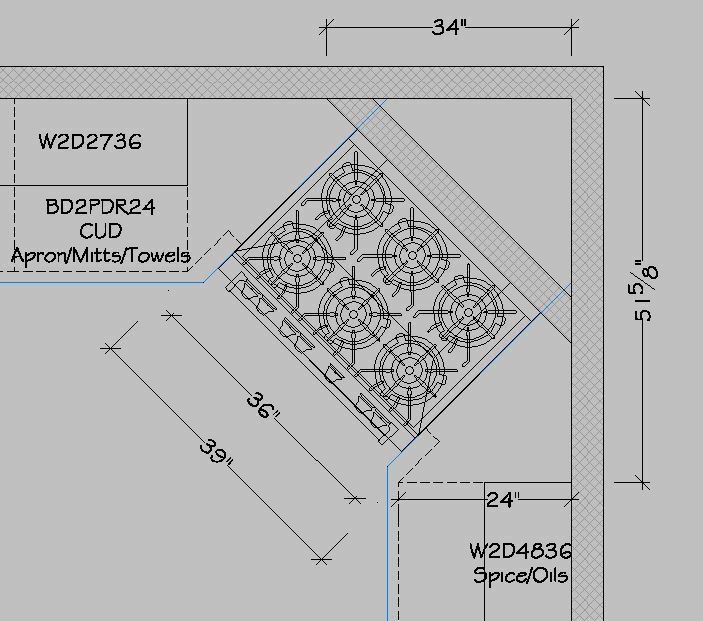 We will start with a desired 36” Stove width plus the total countertop overhangs (39″) and multiply it by 0.7071 which equals 27.5769, we can round that up to 27.6”. Next we need to add the depth of our base cabinet to that figure, 27.6” + 24” = 51.6”. Now we can plot that distance from the corner of the room to each of the adjacent base cabinets. The wall behind the corner stove can be placed after the upper cabinets have been figured out using the same method. Special considerations should be made when using a microwave as it will be a different depth than the upper cabinets in most cases. 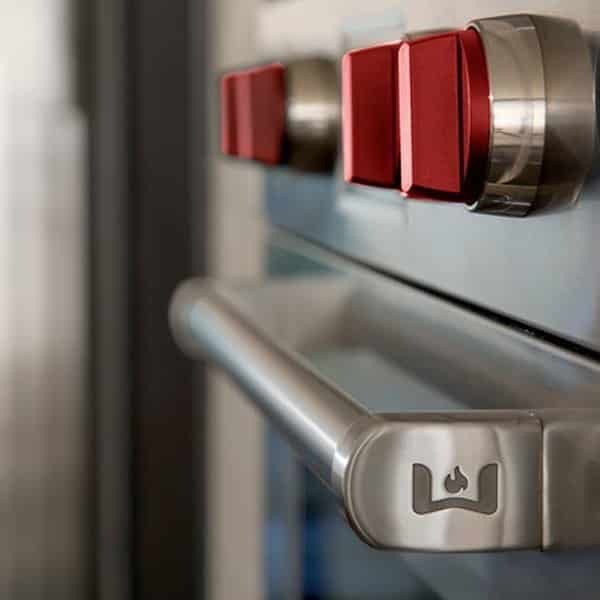 When setting that appliances you will notice that the stove will need to be set back from the face of the adjacent cabinets to allow for the doors/drawers to operate freely, we typically set the stove back approx. 4”-6” and leave about 2” behind the stove to the wall. As an added bonus, the corner stove kitchen allows for a 6” – 8” deep recessed niche to be located just below the ventilation unit. This is possible because the wall behind the appliances is a false wall with a void behind it. This option is typically not possible when a stove is placed on wall in a standard configuration since it’s usually on an exterior wall. Here’s our finished design with a 36″ stove. As you can see on the plans there is a void behind the stove wall which is a perfect place to run the duct work, electrical requirements and plumbing work. Note: If the walls are out of square and/or not plumb it will further complicate the calculations. Need help with your kitchen design plans? Give us a call at 973-636-0100, we’re happy to assist! Take a peek at the kitchen design trends for 2018. The latest in cabinetry, design, finishes, cabinet layouts and more. There’s nothing like having your very own coffee bar located right inside of your kitchen. Everything you need is right at your fingertips in this Keurig coffee bar. Coffee cups and saucers are stored neatly behind the cabinet doors, silverware sits just below the custom K-Cup organizer in these two-tiered drawers. Many types of coffee makers can be incorporated into this design concept including built-in coffee makers. Great for when you’re on the go and for entertaining! Successful kitchen designs all have one thing in common, the focal points. Placing a stove or cooktop in the corner of the kitchen allows you to take advantage of a new area that is not often the center of attention. It also allows the user to have more prep/plating room while eliminating the “dead” countertop area. It works great for larger stoves as well like this 36″ Jenn Air. 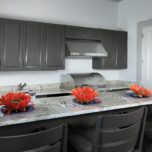 It’s also a very efficient kitchen design for smaller spaces as shown here with a 30″ corner stove and microwave above. A departure from the long standing “work triangle” is taking shape in the form of “work stations”. Although the work triangle is still a relevant concept, the trend is moving towards areas that are designed for the task at hand. The work triangle connected the sink, fridge and cooking areas within a given distance to one another for efficiency, the work station concept allows for those items, and others, to be further apart and more well defined as a clean-up area, food prep/storage area and a cooking/plating station with all the necessary items to complete the task. This type of design is also multi-user friendly. Over the past few years we have seen less and less ornamentation being added to the kitchen cabinets. Strong clean lines with particular attention to the furniture-like details will take over in 2018 as the primary look. Flush inset doors with concealed hinges (shown here) further compliment the furniture-like cabinetry and clean lines. Grey neutrals are gaining traction in the market as great accent colors for the widely popular white kitchen that shows no signs of being taken over in 2018. The look and feel of wood flooring is moving in a new direction, stains and polyurethane finishes are being replaced by reactive agents and penetration oil finishes, the results are astonishing! The idea of staining any wood is to apply color (similar to painting) to the surface equally, making all the wood look the same. The use of reactive agents changes the tannis in the wood creating a natural varied color. A penetrating oil finish is applied to seal the boards, the oil is completely absorbed by the wood resulting in a matte finish. When you touch this product you are feeling the actual wood (not a protective coating) and all of that natural beauty of wood grain and texture. A great accent to the clean lines of today’s kitchens, thick countertops, 2″ or more, are being used on islands and work spaces. Many materials can be used to create this look including; concrete, wood, quartz and granite. Some of these materials come in the desired thickness and others have to be built-up to achieve the desired thickness. Depending on the material the process varies, but generally speaking, the thinner material is glued together as a stacked seam or a mitered seam giving the exterior appearance of a thicker material, the remainder of the interior is filled in with a light weigh MDF or similar material.